At the origin of this project there is Jenseits (Francesco Vecchi from Milano), who wishes to revisit, cite and recite poetry and texts of some songs from “Nomade Psichico”, music work released for “I dischi del mulo” / “C.P.I. (Consorzio Produttori Indipendenti)”, an historical group of the Italian 90s underground music, the AFA (Acid Folk Alleanza) and an oniric “reading” an excerpt from the book ” Provincia Exotica” by Fabrizio “Taver” Tavernelli (voice and leader of the AFA), all complemented and enhanced by two original Jenseits tracks. The project is developed in collaboration with the indie label “Lo Scafandro”, delivered by “Taver” himself. 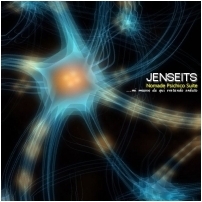 We like to define this second Jenseits work as “psycho-electro sci-fi cover music”. Imagine yourself suspended in the empty icy, adrift in a diving suit, immersed in an infinite silence, away from anything that could be reassuring. You are finished in a space gravitational cemetary, a space debris landfill, spaceships and satellites damaged pieces. Now with these objects try to rebuild a module with ingenuity and desperation, a new building of rough technology survivalist, a rickety space station, a survival structure in a hostile and empty universe. The same space recovery operation performed by Jenseits, tracks, records abandoned in a vacuum. An suite of expansion where pulse signals and messages are collected, processed, analyzed and finally remixed with what remains of a technology of a race once projected into the future and now more closer to a final entropy. Clusters, reverbs, loops dirty and corroded, echo that rebeats between unknown dimensions. “Nomade Psichico Suite” is a meticulous archeology cosmic work, a decipher of distant and unknown languages. As the last light that travels through time to give us news of the death of a star. As in the last human civilization reigns a daily apocalypse. Jenseits is a collector, just as they were the first hominid groups on planet Earth, nomads in search and discovery. Abandoned riches founded on the route, sounds, words, feelings, everything useful for use for reassembly. Forced to the invention, to restore energy and life to what seemed lifeless, but still maintains, in a property, a memory. Fossil life forever seared, enclosed, preserved for that and for those who will come. Matter to be reassembled in an abstract and astral. Giving a new function to sound objects destined to eternal silence. My fossil is “Nomade Psichico,” an album that I jealously protect in a remote part of my soul, a work that marked me, a building and a project that I projected far away, where I thought impossibile to get. An astronomical platform from which I could see, to listen what I had never been able to receive. And just by observing and traveling into the endless space, only the moment of maximum expansion of consciousness, I discovered that I was traveling in myself, in my subconscious, in my deepest own. In the best science fiction interior. So admirable and captious like a black hole, the work that you add in this monolithic work, a labyrinthine inlay pictures, films, literary references, visions and illuminations. Jenseits understood what was behind it, what was there before, what was inside and what was beyond the album “Nomade Psichico.” It’s an amazing kaleidoscopic refraction, a sister galaxy, which is reflected in the multiverse. A ring structure, a circular breathing, a trance, a spiral nebula. Jenseits is the continuation of a trip to an indefinite time, which requires a change of generations for a dark path is revealed by light years of wandering. Reach a new planet, attain a truth, there be achieved, only one destination and now the command of the starship has a new crew brave and utopian, decided in the unexplored walk over the border. Until the next dimensional shift. Good Voyage Major Francis and remember the flight codes.